While you're definitely not going to fool anyone into thinking tofu is a true substitute for anything resembling cheese, this super lemony "cheesecake" is a good vegan dessert. Just good, not great. But hey, at least it's super easy to make, and the ingredients are pretty standard. The crust recipe as written needs work. I had to add an extra tablespoon of butter, but I figured a total of four would work best. Sure enough, I looked up a few homemade graham cracker crust recipes, and most call for that amount. Use any less, and the mixture is too crumbly and doesn't stick well. I also blind baked it at 350 degrees for 8 minutes (or until edges get lightly browned), although the recipe doesn't mention this. The filling is a lot easier. I used a soft silken tofu because I couldn't find a firm silken variety (does this really exist? ), but the end result was fine. 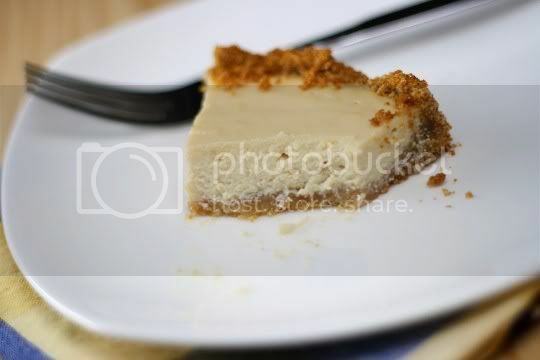 Simply puree the tofu, sweetener, lemon juice and zest, and vanilla until smooth, then pour it into the crust. I had to bake it for about an hour; the recipe suggests 45 minutes, but that wasn't enough to get the center to barely jiggle when moved). Bring it to room temperature, then refrigerate for at least a couple hours before eating (although I'd say overnight is probably best). Because this is a tofu-heavy (read: water-based) filling, the crust will start getting soggy after the first day or so. I'd suggest serving this as soon as it's well chilled, as leftovers aren't the greatest. Now before you take your first bite, just be aware that tofu is the main filling ingredient here...and yes, that's what you will taste. What's surprising, however, is that you really only taste it for the first couple bites. After that, you get a very sweet and tangy lemony flavor with some delicious pungence from the lemon zest. The filling itself isn't super sweet (I suppose the sweetener choice could change this), but it's perfect with the rich, sugary crust. I was actually surprised that the cheesecake set as well as it did; the texture is soft and creamy, thick and pudding-like. The cheesecake leaves a bit of a tofu-ish coating in your mouth, which I didn't like at all...but I surprised myself when I found I couldn't stop eating it. 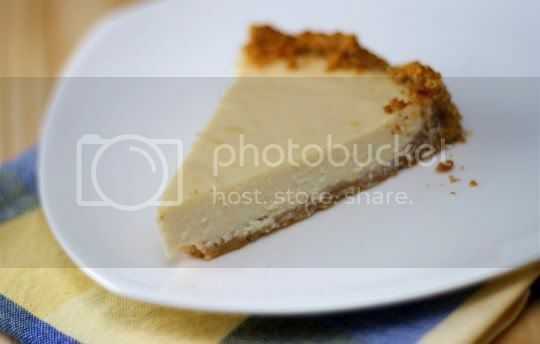 Of course, I knew I wasn't eating anything cheesecake-like; it's more of a tofu pudding pie, if that makes sense. And hey, it's only 160 calories and 4 grams of fat per serving. Beat that, cheesecake! Make again? Probably not. It was interesting making a non-dairy cheesecake, but I'm pretty sure there are better recipes. Preheat oven to 350. 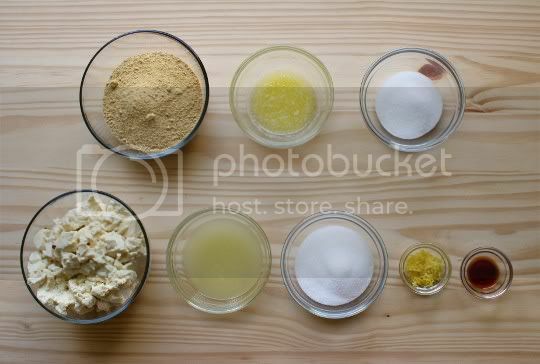 For the crust, mix graham cracker crumbs, butter, and sweetener in a blender or food processor (I used a bowl and fork). Pat into a 9-inch springform pan. (Bake for about 8 minutes, or until edges begin to brown.) For the filling: Blend tofu, sweetener, lemon juice, lemon zest, and vanilla in blender or food processor until smooth. Pour into prepared crust, and bake for about 45 minutes (or until the center barely jiggles and looks dry, I baked for about an hour). Serves 8-12. Recipe from "Lemon Tofu Cheesecake," Tofu and Soyfoods Cookery, Peter Golbitz, Book Publishing, 1998. I am very impressed by the fact that many people are so into tofu-based chocolate mousse. But do you know that when using tofu in your recipes, it takes more effort to whip the protein curd thoroughly. Sometimes, after blending it for so long, the protein particle size is still uneven (just imagine throwing ice into your blender, after you crush it, there are big and small pieces. Similar concept applies to blending tofu). And if you use soymilk or soy powder in place of tofu, then there is no smooth & creamy texture. That's why silken soy puree stands out when compares to tofu, soymilk, and soy powder because during the manufacturing process, silken soy puree has been thoroughly homogenized, which means there are no big or small chunks of protein curd; all are even in size. Also, silken soy puree is smooth & creamy and has low beany taste (much more less than the regular tofu, soymilk, or soy powder). If you like to learn more of this product, you can check it out at: http://silkensoypuree.morinu.com/. It has very detailed information on silken soy puree.